Home / Reviews / Flavored Coffee Sampler! Wake up to flavor! Flavored Coffee Sampler! Wake up to flavor! I love coffee, and I love flavored coffees, I have tried so many coffees and most of them are ok, they are not great but, they do the trick. I did however, get to try the Two Rivers Flavored Coffee Sampler and I believe I may have found the best flavored coffees ever. 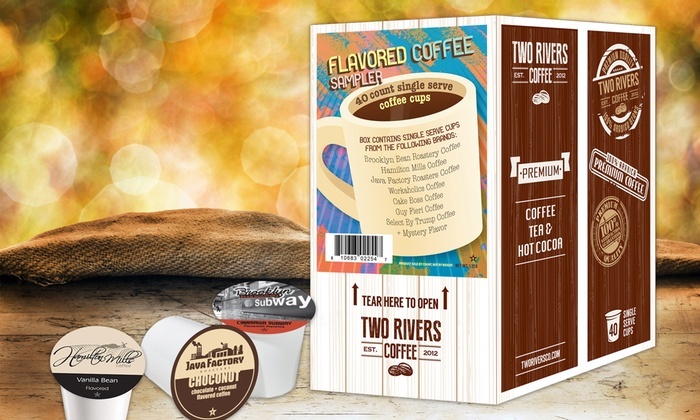 In the Two River’s Flavored Sampler contains coffees from Brooklyn Beans Roastery, Hamilton Mills, Java Factory, Workaholics, Cake Boss, Guy Fieri, Select by Trump and even a mystery coffee, I like all of the flavors, but my son is partial to the Workaholics brand. We have four coffee drinkers here, some of us like vanilla, some cinnamon and others like myself prefer coconut and two or more flavor mixes. All of us have found something that we really enjoy in this sampler box of 40 cups. It has been great to be able to have a choice of just about any kind of coffee you can imagine. I am one to enjoy the flavor of the coffee, and unfortunately most flavored coffees come across as just a flavor rather than a true coffee with flavor added. There is no bitterness and no harsh flavors in the coffee at all, I have found that some flavored coffees tend to be bitter, but when you start with a great coffee then you know that no matter what you add to it you are going to have a hit on your hands. Two Rivers has done that so well by using the best beans and the best flavoring, melding them together perfectly makes the perfect cup of coffee. If you love flavored coffees or perhaps you have not tried them too many times yet this sampler is the one to ge. You can sample about any kind of flavor you would like without committing to the whole box of it being the same flavor. I love that idea and I love that with this sampler you get fabulous coffee with flavors. The point of coffee is to enjoy it, and the point to have a one cup at a time brewer is so that everyone in your house hold can have whatever kind of coffee they like, with the Two River Sampler you get all of the advantages, of enjoyment and a new flavor for everyone! Check them out on Amazon and on their social channels so you can always be up to date on new samplers and coffee specials. Next post: Stacked is Ready for Breakfast! Two Rivers Coffee Giveaway - Here We Go Again...Ready?